Allen Iverson often wears cornrows. Allen Iverson hairstyles are popular on the court and on the street. Sporting a Rastafarian hip hop look such as Allen Iverson can put you ahead of the style game. Allen Iverson leads the Denver Nuggets to win after win with his trademark crossover dribble and his stats, scoring an impressive 27.8 point average per game. Led only by Michael Jordan and Wilt Chamberlain, he is considered to be one of the most consistent scorers in basketball history. Not one to sit down and keep quiet, Allen Iverson has challenged both his coaches and the NBA for their rules pertaining to practice and dress codes. A rebel in style, Allen still believes that it's not what happens off court, or the way you dress, it's only the game that matters. You have to love a man who isn't afraid to take a few risks. Change seems to be Allen Iverson's mantra, and his hair is certainly where he applies this unique sense of logic. His carefree spirit and inner passion play out on the court and in his personal style. Hair trends may come and go, but when you lead the pack and set your own trend, it's easy to stay ahead of the competition. 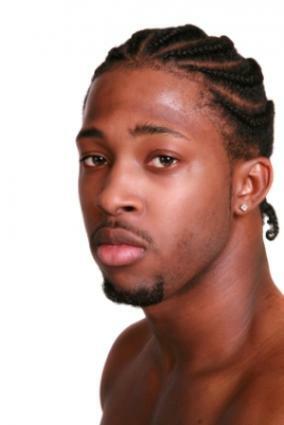 When he's sporting his signature braid hair styles and unique braid designs, Iverson inspires a whole new game of black men's hair styles. His hair fashion statements send the crowds cheering week after week as he showcases his unique and inspired locks. Cornrow braids are a popular, natural choice for grooming African origin hair. Braiding hair is an effective way to manage long, unruly locks while keeping their length. When hair is braided in a cornrow fashion, it can be worn long without the need of chemical or mechanical straightening tools. Although braiding has been an art for centuries, it was first made popular in the 1960s during the Black Is Beautiful movement. Many Caucasians stepped up to bat in 1979 after actress Bo Derek rocked her infamous cornrow braids in the movie 10. Now famous throughout tourist Caribbean island destinations, braids have an easygoing, carefree vibe that is perfect for the hot days of summer. Although the art of braiding hair close to the scalp is a skill that anyone can learn, it is difficult and requires lots of patience and practice. It's always best to seek the counsel of a professional stylist prior to taking the braid plunge. Maintenance is key: If braids are worn too long, they will begin to mat and will need to be cut out, unless you're trying to achieve dreadlocks. Seek the help of an experienced stylist to remove and braid your locks regularly. Moisturize: Keep the hair and scalp moisturized while sporting braids. Invest in a quality spray on conditioner to keep your Rasta roots shiny and healthy. Sleep on Silk: It's always best to sleep on a silk pillow or wear a silk scarf turban to bed to keep braids from matting and tangling. Silk pillowcases can be found in department stores and online. Silk scarves can be found at local beauty supply shops. Cleansing: For hygiene purposes, you'll still be shampooing your hair every few days, even if you wear braids. There are several soothing cleansers specifically formulated for braids that not only cleanse, but also soothes the itch that can be common with braids. To cleanse your hair, press shampoo lightly onto the scalp, rather than scrub. Rinse thoroughly and follow with a soothing leave in conditioner. No Pain: If your braids are causing discomfort, they may be too tight. Never suffer for fashion. Get some help immediately and remove or loosen tight braids before they cause endless headaches and sleepless nights. Trims: Get a haircut every six weeks, in between your braided styles, to keep ends healthy and prevent long term damage. Once you get into the groove of having your hair braided, you can experiment with different styles, techniques, and colors. Just like Allen Iverson, you can play the braid game, your way.